Could it be that time already? Summer is definitely drawing to a close as children and youth across Canada put on their backpacks, meet their teachers and discover new friendships. 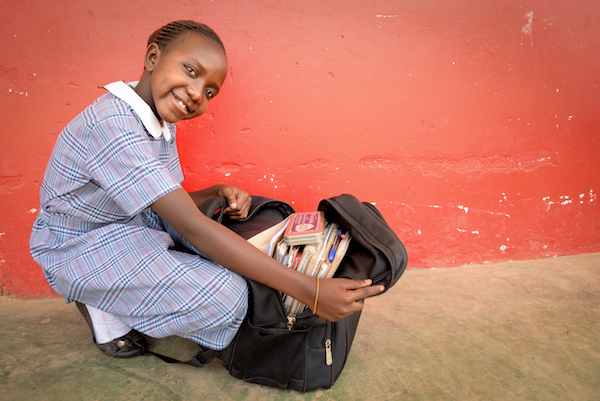 We want to fill your “backpack” this month with some great supplies for you as you volunteer with Compassion! There is something for everyone. We have added some new resources, upcoming connect times, and updates on Compassion’s ministry. Children’s Explorer Magazine – The latest release of this amazing resource for families and children has arrived and is available on-line!! Discover great content for the children in your life or share it as a resource with your church and children’s ministry team. Join an Upcoming Call with other Volunteers – Do you want to connect with our Volunteer Network staff and meet other volunteers? Join this unique opportunity to be inspired and receive the latest information on volunteering and Compassion’s ministry. Email us or call our team @ 1-800-563-5437 x 607 to register! An Invitation to See – Have you ever considered visiting your sponsored child or joining us on a trip to encounter Compassion’s ministry through the local church? Here’s what you need to know as you consider this life-changing opportunity. Strategic Compassion – Our President/CEO Barry Slauenwhite just released his book Strategic Compassion, inviting us to learn about the gospel-centric strategy to winning the fight against poverty. Order your copy today! Sharing Compassion Kit – Have you taken a peek at our amazing resources? These are available to preview and download on-line. Begin sharing YOUR story with others of why helping children through Compassion’s ministry works! Let us know how you will be sharing and we will send you a personalized kit and walk with you every step of the way. We trust that your fall season gets off to a great start. We are praying for you and cheering you on!